Luxuriously romantic, stretching along a secluded beach, El Dorado Maroma, a spa resort by Karisma, is Mexico’s premier adults-only resort. 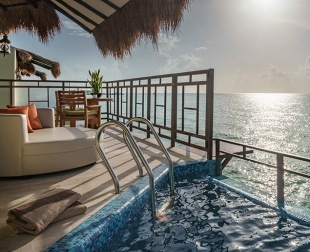 Located in the heart of the Riviera Maya, the resort’s Palafitos-Overwater Bungalows, a cluster of exclusive, private bungalows sitting right over the turquoise waters of Maroma Beach, are the only overwater bungalows in the region. Watch the sun rise and set in a stunning display of colors right from your private deck. Take a dip within your private infinity pool, offering picture-perfect views of the sparkling sea. Pamper yourself with your Aguas del Amor private outdoor shower. If you’re looking to experience ultimate relaxation, step right into the overwater Náay Spa, boasting treatments utilizing traditional Mayan herbal practices and the antioxidant-rich Maroma Beach sea moss. Nothing is more relaxing than a Couples side-by-side full body massage on the beach. And, in the event you decide to venture outside the resort, the El Dorado Maroma is just 10 minutes north of Playa del Carmen, 15 minutes away from the Playacar Golf Club and 35 minutes south of downtown Cancun. This is the perfect vacation to rekindle the spark of romance in your life!